A spirited U 21 Samoan side put on a tough performance against Fiji but lost in the final to finish in fourth place in the Digicel Punjas International Youth Netball Series. Fiji finished in third spot after beating their Pacific rivals 48-42 in Suva last night. 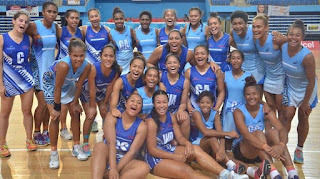 Fiji Times reports the Baby Pearls struggled in the first two quarters allowing the Samoans to lead 23-21 at half time. Fiji came out strongly in the second half with coach Vicki Wilson making some key changes to their game plan. Wilson said she was happy with the performance of her players. "We are delighted to finish the series in third position with a win against Samoa and we made it very tough on ourselves. "It was a slow start though but we managed to put it together in the third quarter and we need to make sure we really value the ball in our forward line and get the ball into the ball circle in scoring opportunity." Samoa coach Lee Edwards said Fiji played better. "It was a good game against Fiji," she said. "We are happy with the performance with the young players in the team." Australia won the series beating New Zealand 52-43.